Corry Micronics offers d-sub miniature connectors in "C" and "Pi" configurations. Filtered d-sub miniature connector adapters are also available in several different values. Chip capacitor or tubular filter versions are also available. Corry Micronics introduces its new line of filtered D-Sub Miniature connectors. 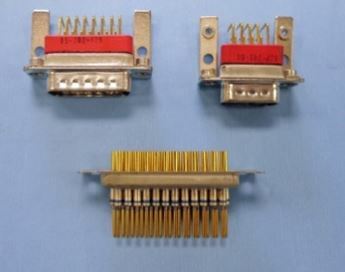 Filtered connectors are available in pin counts from 9 to 50 pin. Micronics offers the d-sub miniature connectors in "C" and "Pi" configurations. Filtered d-sub miniature connector adapters are also available in several different values. Chip capacitor or tubular filter versions are also available. Cost-Effective Solutions - Innovative product design that replaces individual chip capacitor filters on the PCB, with feedthru capacitors, or chip-on-board filters, keeping cost down but maintaining the highest quality performance. Design Flexibility - Available pin counts from 9 to 50, to better suit our customers’ need. Compact Design - Compressed, space-saving .318” footprint, interchangeable with standard D-subminiature connectors. Performance- Superior filtering of high frequency interference; provides expert EMI shielding. Reliability - Each D-subminiature connector is 100% tested, going through our rigorous testing process to ensure constant performance.